My Stump-mate Noam has been doing a nice job of tracking the shift in approach from Team Obama’s “new politics” campaign in 2008 to its more mundane, grind-it-out strategy this time around. He zeroed in on the exact right example—Chicago’s emphasis on trying to score points on manufactured kerfuffles such as the Republican National Committee chairman’s ironic (and if you ask me, innocuous) comparison of women to caterpillars. Four years ago, candidate Obama would have scorned that sort of game-playing. But I think that all of us political reporters need to be careful not to overstate the contrast between the two campaigns. Yes, Team Obama just put out a tough ad attacking Mitt Romney for outsourcing jobs at Bain Capital and for his Swiss bank account. But let’s not forget—they were putting out some pretty tough, and arguably unfair, ads and mailings back in 2008, as well. They hammered Hillary Clinton for requiring that everyone buy health insurance or pay a penalty (wait, isn’t that...yeah) and over her support for the passage of NAFTA during her husband’s administration, attacks that provoked a memorable tirade from her (“shame on you, Barack Obama!”). During the general election, Obama went after John McCain for supporting a huge tax increase—McCain’s proposal to replace the tax exemption for employer-provided health care with a new tax provision that would make health insurance partly deductible for all taxpayers, including those who buy health insurance for themselves. The plan had major flaws, but Obama’s attack seriously distorted it, and a limited version of McCain’s idea—cutting back on the tax preference for employer-provided insurance—has also made it into Obama’s health care law, in the form of a tax on high-priced employer-provided health plans. 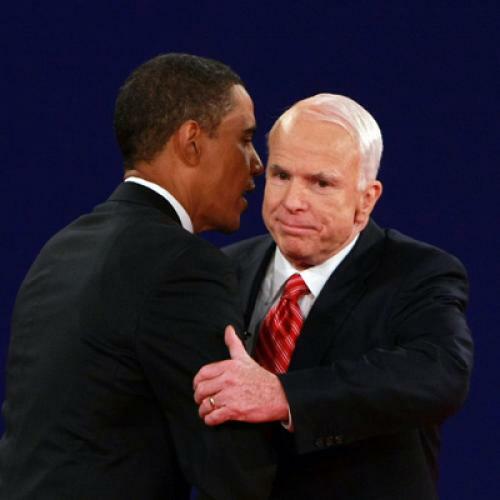 All told, tallies after the 2008 campaign found that at least two-thirds of Obama’s ads in the general election were negative attacks on McCain. So even in ’08, hope and change went only so far.